I was asked by my friend Lauren of Tutus and Tea Parties if I would like to do a guest post for her while she was on vacation. I said yes of course, and then for several days was not sure what I was going to post about. Then during the time my mom was visiting, we went to go see the movie Despicable Me 2. We all really enjoyed the movie, especially the minions. 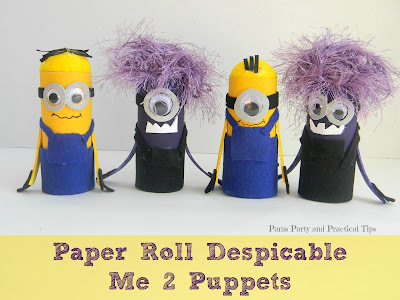 Then it hit me, why not make minion puppets from the movie. Once I knew what I wanted to make, everything quickly came together. Be sure to stop over at Tutus and Tea Parties today to see how I made my minion friends.